Though the recent spate of in-your-face jeans trends has made us re-think our standards about denim (floral jeans? whiskers? jeans shirts with jeans pants, a la the cowboy tuxedo ? We're in! ), every women has to draw the line somewhere. And that line is the Jean Sandal Boot. 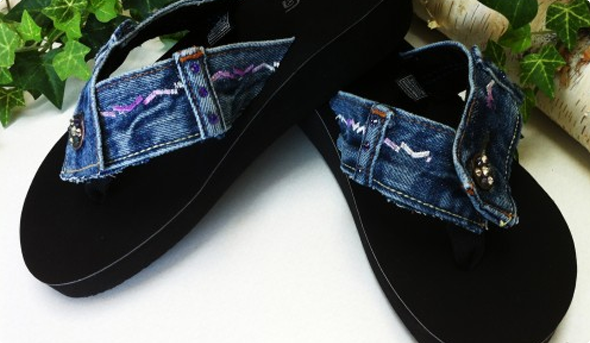 Made from vintage blue jeans by Israeli Etsy designer DaniKshoes, this unimaginably odd footwear is handmade, one-of-a-kind, and sports four useable pockets. On its website, DaniKShoes touts the Jean Sandal Boot as "fun that never goes unnoticed!" and is selling them for $140 a pop. All jokes aside, we're wondering how one could possibly style these. Maybe with a pair of matching jeans tucked in to them? (A sort of denim version of the movie "Inception"--you could have jeans within jeans!) What we really want to know is how you get them on: Fingers crossed it's a zipper fly—we can't imagine buttons would be easy to work at ankle-level (though they might make the fun never go unnoticed). 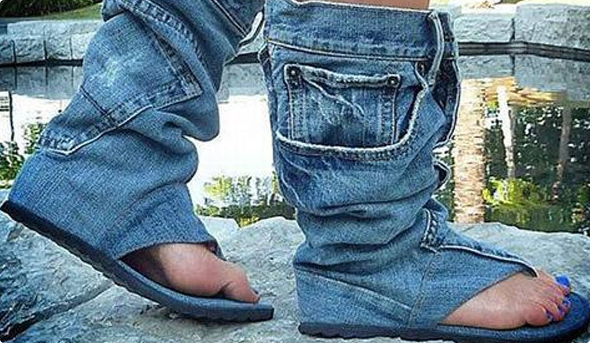 If these boots aren't exactly your style, fear not—the Etsy shop that sells them makes a wide variety of jean-flops, each more horrific than the next. At $140, we'll save our money for some less fashionably traumatic shoes. Like Crocs, or rollerskates with missing wheels. Yes I agree with Bridalbuy, Jean-flops is a creative and nice idea. But I think it is too much. According to me, it's a nice creativity with denim.It can be a fashion trend in the future.